Today’s business world is more demanding for ability to conduct business almost anywhere. As a mobile professional, you may find it handy to print on-the-go, and Canon gives you this opportunity. The new PIXMA iP100 Mobile Printer from Canon U.S.A, successfully addresses printing needs on-the-go and delivers text and graphics for printing a business presentation or a contract. It prints borderless color photos from the car or even at the beach. This printer has increased color resolution and is faster than previous models. The lightweight Canon PIXMA iP100 Mobile Printer fits easily onto a desk or into a case making it the perfect laptop companion for business or personal travel. The PIXMA iP100 Mobile Printer’s new design includes increased color resolution to a maximum 9600 x 2400 dpi, one picoliter droplet size (the first-ever mobile printer to have a minimum), and increased print speed. Additionally, the printer will use 2 black inks, one a pigment-based black ink for text and another for printing photos. The total volume of the pigment black ink tank has been increased by 50%. 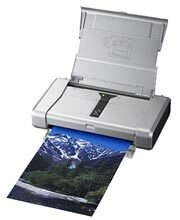 The Canon PIXMA iP100 is the first mobile printer to have Auto Image Fix technology. With a laptop, this technology automatically recognizes the scenes in photographs and optimizes printing settings according to the scene type, such as Portrait, Scenery, Snapshot, etc. With print speeds of up to 20 pages-per-minute for black and up to 14 ppm for color, this printer can deliver projects faster than previous models. The PictBridge port allows printing 4-x 6 inch to 8-x 10 inch and legal size pictures from a compatible digital camera or DV camcorder without a computer. The PIXMA iP100 Mobile Printer features a standard USB 2.0 Hi-Speed connection. Besides, business professionals have the option to print wirelessly from the built-in IrDA port or from select Bluetooth enabled cellular phones and computers with the new optional user installable Bluetooth Unit BU-30 (not included). Canon offers the optional LK-62 Lithium Ion battery that last enough to make 290 pages per three-hour charge. Also, Mobile professionals will benefit from the optional Automobile Power Unit to power their PIXMA iP100 Mobile Printer directly through a car power socket. The iP100 Mobile Printer is available for $249.99. The LK-62 battery costs an additional $99.99, and a compatible Automobile Power Unit (PU-200U) sells for $89.99. This entry was posted on Monday, April 21st, 2008 at 6:59 am	and is filed under Canon, inkjet, printer. "How to Identify Genuine HP Toner Cartridges"